Parrot lore: In the story Treasure Island, by Robert Louis Stevenson, a parrot accompanied pirate Long John Silver at every moment. 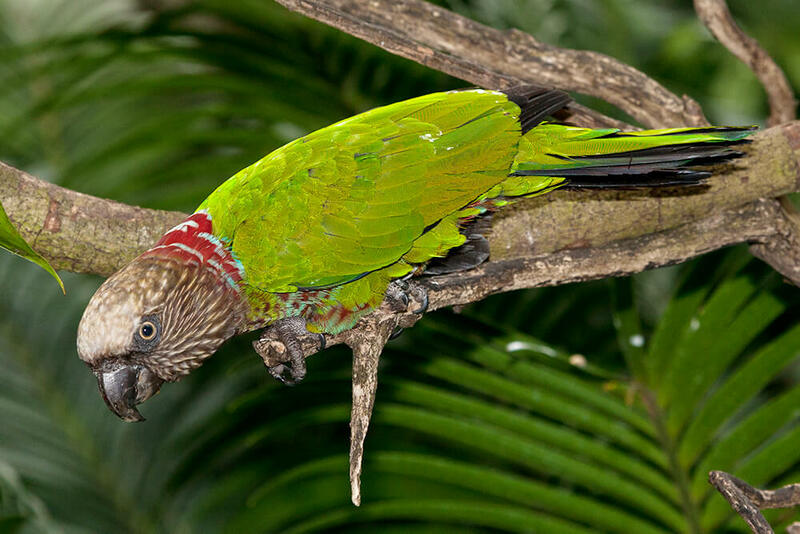 Were parrots really associated with pirates? Maybe not, but they are fascinating birds, so it is no wonder parrots appear in children’s stories. Parrots come in a variety of bright colors, mostly made up of greens, reds, blues, and yellows. 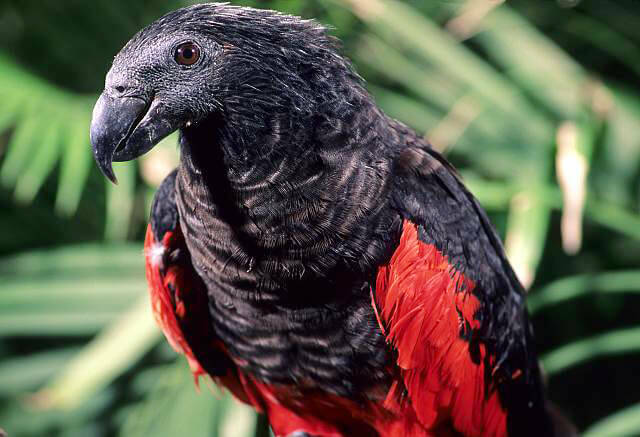 There are exceptions, though: the Pesquet’s parrot is black with red trim, and you can probably guess what color the African gray parrot is! 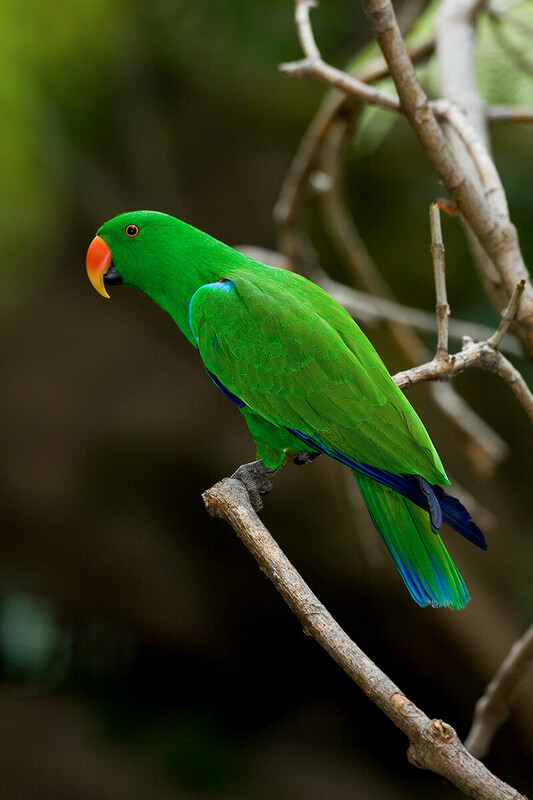 There are 279 parrot species in the world that include macaws, keas, lovebirds, parakeets, lorikeets, and kakapos. Although quite different from each other in many ways, these birds all have a curved beak, zygodactyl feet, and generally eat nuts, seeds, fruits, and insects. Parrots have thick, strong beaks that are perfect for breaking open nuts and seeds with tough coverings. Macaws have such strong beaks that they have been reported to snap through broomstick handles! Zygodactyl feet are also very strong and helpful in holding slippery nuts and fruit. The world’s largest parrot is the hyacinth macaw, found in South America, at about 40 inches (100 centimeters) long. But it's not the heaviest bird in the parrot family: that honor belongs to the kakapo of New Zealand, which can weigh up to 6.6 pounds (3 kilograms), too heavy for its size to fly. The smallest parrots are the pygmy-parrot species, which are less than 4 inches (10 centimeters) long, weigh just 0.3 ounces (10 grams), and are found mostly in New Guinea and on nearby islands. Parrots are popular as pets because they are so outgoing, social, intelligent, and have the ability to “talk.” Although they can make a good pet, some people who buy them may not know where their bird really hatched. 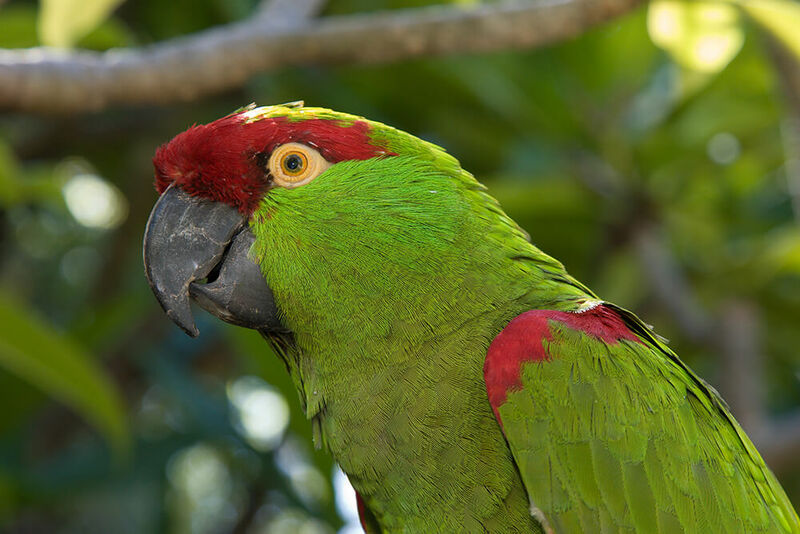 The Convention on International Trade in Endangered Species discourages the pet trade, which often takes wild parrots out of their natural habitat to sell them as pets. This is dangerous for the birds, as many do not survive the journey from their home to a pet store. It is also dangerous for the new owner, who can be badly bitten or have a hard time training the bird. Fortunately, the trade in wild parrots is slowing down, and some parrot populations are starting to recover. People who want to have a parrot for a pet need to know that these birds require lots of attention from their owners, they are messy eaters and poopers, and they can be very noisy—especially early in the morning. Your neighbors may not like that! This is a bird that will be around for almost your entire life, living up to 60 years in captivity. That's a long commitment for a pet owner. A parrot is a smart animal that can become easily bored in a cage, so make sure, if you are thinking about getting one, that you really have the time and patience for one. If the bird does not receive enough affection, enrichment, and exercise, it will become aggressive and destructive, even plucking its own feathers if it is bored or unhappy. African gray parrots are popular because they are known to "talk." Although they do not know what they are saying most of the time, they are excellent at mimicking hundreds of sounds in their surroundings. In the wild, however, these parrots, like most others, do not imitate noises around them. African gray parrots live in tropical and subtropical forests and woodlands in Africa. Like many of their relatives, they are frequently found in flocks of 20 to 30 birds. They are not yet endangered, although habitat destruction and the illegal sale of birds as pets are starting to take a toll on the wild population. Most parrots live in warm climates, although not all: thick-billed parrots, maroon-fronted parrots, and keas live in snowy alpine areas and are even referred to as snow birds. Parrots that don't live in areas with trees use cacti, termite mounds, or rocky outcrops to make their home. Thick-billed parrots are one of the few parrots that once lived in the U.S.; now they are found only in northern Mexico. The Carolina parakeet was another U.S. native; sadly, by the 1920s, this species was extinct. Parrots are very social birds and live in large groups called flocks, sometimes up to 1,000 birds! Living in a flock helps parrots watch out for predatory birds, but it’s also fun to have someone else to talk to! Parrots are known for being very vocal: squawks, screams, and screeches can be heard from faraway in the forests. These calls are used to keep track of each other. Most parrots are seed eaters. They all have strong jaws to help the bird crack open hard nuts and seeds. In forested areas, parrots feed high in the trees, coming to the ground only to drink. Keas have a long, narrow bill that is used to dig up insects from the ground, pry bark from trees, and scrape meat from bones. Thick-billed and maroon-fronted parrots feed on pinecone seeds in their alpine habitat. The kakapo chews on stems and leaves, swallowing the juices for food. Numerous parrot species are monogamous. They usually woo their mates with vocalizations and tail displays. Parrot eggs resemble chicken eggs, and the parents take turns sitting on the eggs, although the mother spends more time doing this than the father. Chicks are almost completely naked when they hatch, except for a thin layer of down feathers on the back. Their eyes are closed until they are about two weeks old, and at three weeks, the chicks' adult feathers start to appear. These feathers are so thin and pointy that they are called pinfeathers. The mother is the one that stays with the babies while the father goes off to get food for the family for the next month or so, until the chicks fly off on their own. Both the San Diego Zoo and the San Diego Zoo Safari Park have a variety of parrot species. 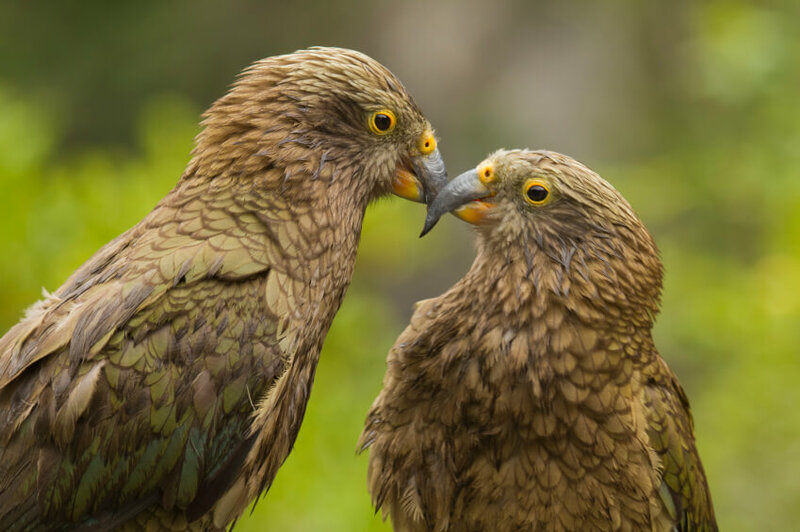 The San Diego Zoo has a breeding pair of keas, native to alpine and forest areas of New Zealand. The Safari Park welcomed two endangered thick-billed parrot chicks. At the Safari Park, you can experience a rainbow on your shoulder in the Lorikeet Landing aviary. Walk inside, and you are transported to the rain forests of Australia and New Guinea, the natural habitat of the green-naped lorikeet. These beautiful, colorful birds are also known as brush-tongued parrots, because their tongues are specially adapted to extract nectar and pollen from flowers. In Lorikeet Landing, the birds don’t have to put in as much effort because you lend a hand—literally—and feed the lorikeets! Purchase a small cup of special nectar and hold it out, and lorikeets will land on your arms and hands to eat from the cup. The birds have been specially trained to overcome their natural fear of humans, and they aren’t shy when it comes to feeding—several birds at one time may even sit on your arm, or even your head and shoulders. Have your camera ready! If you cruise around the Children’s Zoo at the San Diego Zoo, attend our Frequent Flyers Bird Show at the Safari Park, or watch the news on TV, you can often see some of our parrot ambassadors. 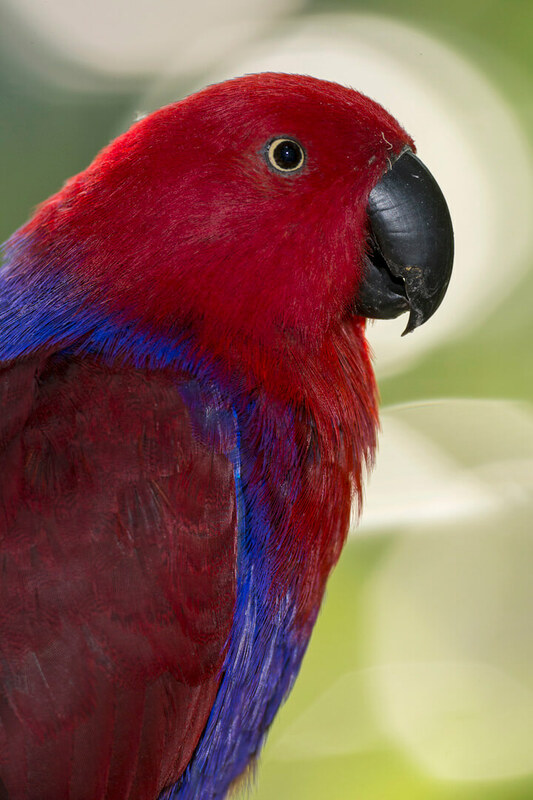 Parrots are wonderful animal ambassadors for our Zoo and Park with their beautiful colors and personalities. They help get the message out to the public about the high maintenance of parrots as pets and the concerns for wild parrots due to deforestation and the illegal pet trade. Look for them on your next visit! One quarter of the world’s parrots are threatened with extinction, due to a combination of habitat destruction and trapping for the pet trade. The pinecone-eating thick-billed parrot is a prime example. San Diego Zoo Global participates in the Species Survival Plan for this bird and collaborates in the field with local scientists in Mexico, where we are conducting a population census, monitoring disease, collecting data on chicks, and analyzing food sources. We also contributed funds for the acquisition of 555 hectares of mountainous habitat in Mexico to create a reserve crucial for the welfare of the maroon-fronted parrot, another pinecone-dependent parrot. Parrots tend to favor using one foot more than the other, just like people are right- or left-handed. Lories and lorikeets have a body part that is unique among parrots: a brushlike tongue that allows them to sip nectar. Known for their skill at mimicking sounds, some African gray parrots can "speak" over 700 words. The first written account of a parrot in captivity was recorded in 400 B.C.